A couple of years ago, a bunch of Made-in-India cars were in the news for all the wrong reasons. They had scored Zero Stars in the Global NCAP test, which called them unsafe. On the other side, there are more than a few Made-in-India cars that have actually passed NCAP tests with flying colours. Indian manufacturers do have the technology and capability to produce safe cars. Here are seven such India-made cars that are super safe. The Tata Nexon has finally been tested by Global NCAP. The Made-in-India SUV has performed pretty well in the crash tests and has received a decent 4-star rating for adult occupant protection and a 3-star rating for child occupant protection. The body shell of the Nexon has been rated as ‘stable’. The Indian-made Jeep Compass has scored a perfect five in the Australian NCAP crash test. Jeep has begun exporting the Compass SUV to Australia and Japan, two right-hand drive markets. The right-hand drive version of the Compass is built at Fiat’s Ranjangaon factory near Pune. The vehicle is also sold in the Indian market. Let’s start with the cheapest car on the list, the Toyota Etios Liva. It is also the least-priced offering from Toyota in the Indian market. Though the Liva may not be an exciting car to look at, but one thing is for sure, it certainly is a safe car. For starters, Toyota has been offering dual airbags as standard across the Liva range, which is something we really appreciate. In a test conducted by Global NCAP, a 2016 Liva was crashed and it scored a good 4 stars for adult protection and 2 stars for child protection. The car scored 13 points from a maximum of 16 for adult protection. The test conducted was the Frontal offset test at a speed of 64 kmph. Okay, let’s clear some stuff out before we explain this one. When the first lot of Indian-made care were tested by Global NCAP, the Polo scored 0 stars as the model that was tested wasn’t equipped with airbags. However, after receiving that result, VW immediately took action and equipped all the Polo variants with dual airbags. The car was then tested and it recorded a 4 star rating. The car also scored 3 stars in child protection. Out of a maximum of 17 points, the Polo managed 12.54 where as the one without airbags scored a dismal 5.42. Is just adding airbags enough to increase the rating? Well the answer is not so simple. If the body structure is stable and able to withstand the forces, adding airbags will certainly bump up the score, as is the case with the Polo. However, if the body structure isn’t stable like that on the Datsun Go, even airbags will not increase the score. The VW Vento has two different star ratings based on the variant. The ones without ESP score 4 stars and those with ESP (1.2 TSi) score 5 stars. The reason is that ASEAN NCAP requires ESP as a pre-requisite for cars having a 5 star rating, and hence only the 1.2 TSi version gets the 5 star rating. Both versions have the same rating of 14.51 out of 16 for adult protection so both cars have an equally stable and strong body structure. The Hyundai Creta is a successful compact SUV in the Indian market. India is also an export base for the Creta. The Latin NCAP recently tested an Indian-made Creta, and the vehicle scored a 4 star rating. The vehicle in question however was a left-hand drive version. The vehicle scored 15.57 points out of a maximum of 17. The vehicle was only equipped with dual airbags, which is what comes standard in the Indian version as well. The body shell was rated as stable and capable of handling more loading. The XUV 500 is the first monocoque car from Mahindra. The vehicle is available in various international markets as well. 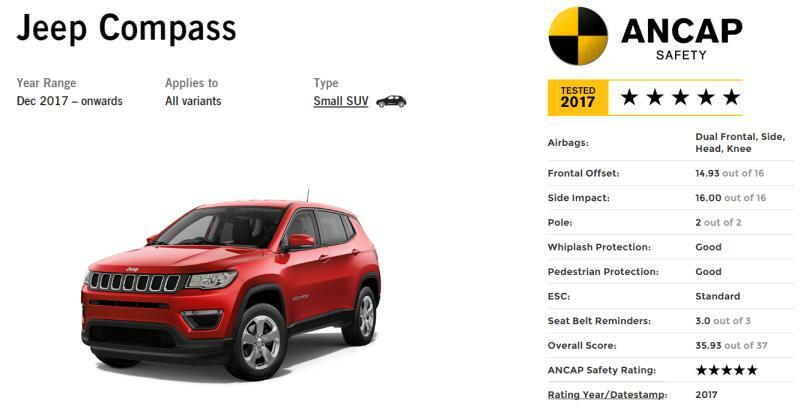 Australian NCAP has tested the vehicle to find that it comes up with a 4 star rating. The model in question is an AWD version, and the car was tested for both frontal and side impact tests. In the frontal offset test, the XUV scored 10 points out of 16 and in the side impact one, it managed an impressive 16 out of 16. Overall the vehicle scored 26 out of a maximum of 37 points. So, then why don’t many Indian automakers provide safe cars for Indian buyers despite having the capability to build safe cars? The reason why most Indian manufacturers don’t provide safe cars for India is due to the fact that the regulations aren’t strict enough and they don’t demand stringent crash tests. Abroad however, they cannot get away with the same. Things will soon change with the introduction of the Indian NCAP (BNVSAP) in 2019, which will set down strict guidelines to provide the country with safer cars. Indian manufacturers have already begun getting their cars crash tested ahead of the new regulations that are going to come in 2019.